We've never seen a boy who could pass a puddle by! Our young lad climbs barefoot to peek over the wide rim of our pedestal birdbath and mischievously splash a graceful butterfly in this perfect sculptural celebration of childhood summers. Cast in quality designer resin and hand-finished to replicate fine stonework, our artistically rendered exclusive is a true heirloom investment. Please read product descriptions very thoroughly. If in doubt regarding a product detail, please ask a question. Thank you for looking and be sure to check out my other auctions for more great deals. 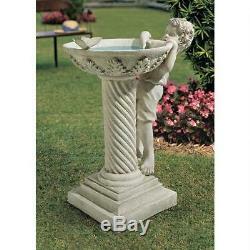 The item "Whimsical Young Boy Sculpture Pedestal Birdbath Yard Garden Decor NEW" is in sale since Saturday, January 13, 2018. This item is in the category "Home & Garden\Yard, Garden & Outdoor Living\Garden Décor\Statues & Lawn Ornaments".